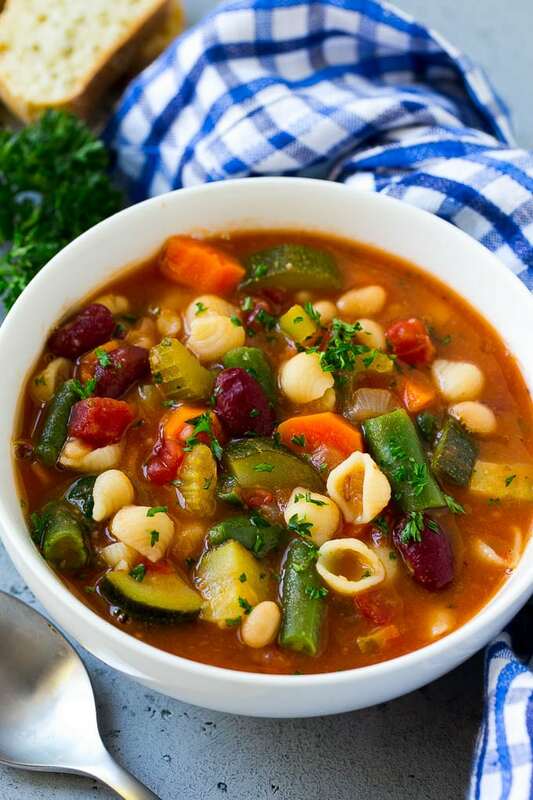 This Olive Garden minestrone soup is loaded with vegetables, beans and pasta in a tomato broth. It’s a copycat of the restaurant version that tastes even better than the original recipe! Every time I go to Olive Garden I order the soup, salad and breadsticks. 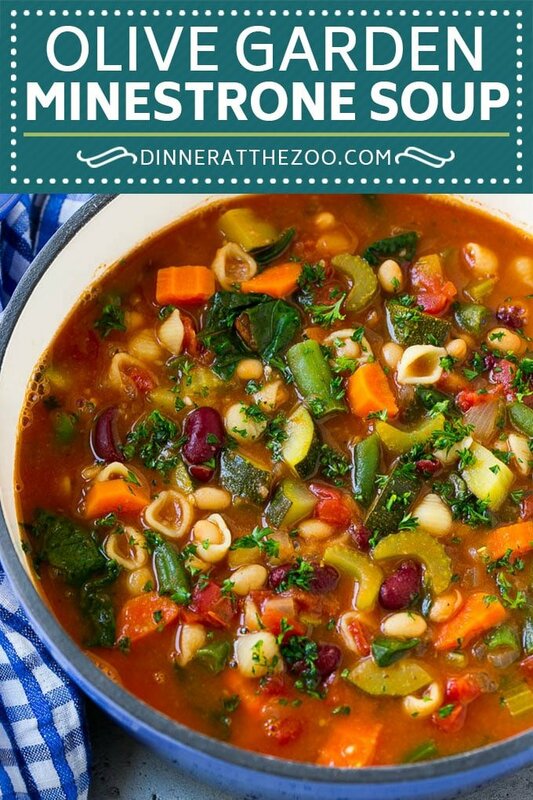 I just can’t get enough of their minestrone soup, it’s my favorite! This homemade version is easy to whip up and is a great way to get the family to eat their veggies. Serve your soup with garlic knots for a complete meal. Every time I go to Olive Garden, I have to get the minestrone soup. It’s filled with tons of great flavors and textures, yet is light enough not to fill me up before the main course arrives. This recipe is an Olive Garden minestrone soup copycat, and I have to say, it’s as good (or better!) than the original. How do you make Olive Garden Minestrone group? This recipe calls for a variety of vegetables cooked in a savory broth. 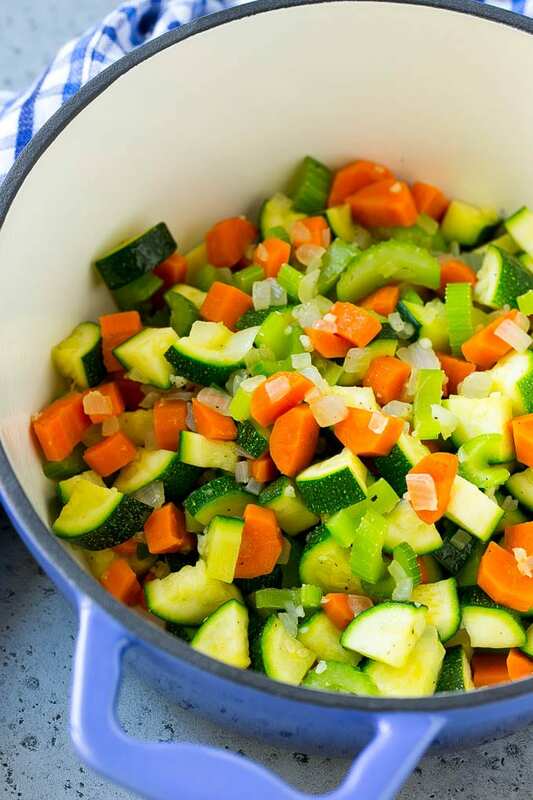 Onions, carrots, celery and zucchini are sauteed, then tomatoes, vegetable broth, pasta and beans go into the mix. Let everything simmer and dinner is served! What vegetables go into minestrone soup? This soup can easily be made in the slow cooker if you’d prefer to go that route. You can add all the ingredients to the slow cooker minus the pasta, spinach and parsley, then let everything simmer for 4-6 hours on low or 2-3 hours on high. Stir in the pasta and spinach and let everything cook for an additional 20-30 minutes, or until pasta is tender. Sprinkle with parsley and serve. You can use fresh or frozen green beans, whatever you prefer. Try to cut all the vegetables the same size so that they cook at the same rate. This soup freezes well, although the pasta and vegetables may be a little softer upon thawing and reheating. Be sure to drain and rinse your beans before adding them to the soup, you want to get rid of all that extra sodium! This soup is hearty enough to serve as a main course, but if you’d like an extra dose of protein, try adding some cooked Italian sausage. This Olive Garden minestrone soup hits the spot on a cold day, and it’s so easy to make too! Add a sprinkle of parmesan and some warm bread and you’ve for a quick dinner that everyone is sure to love. 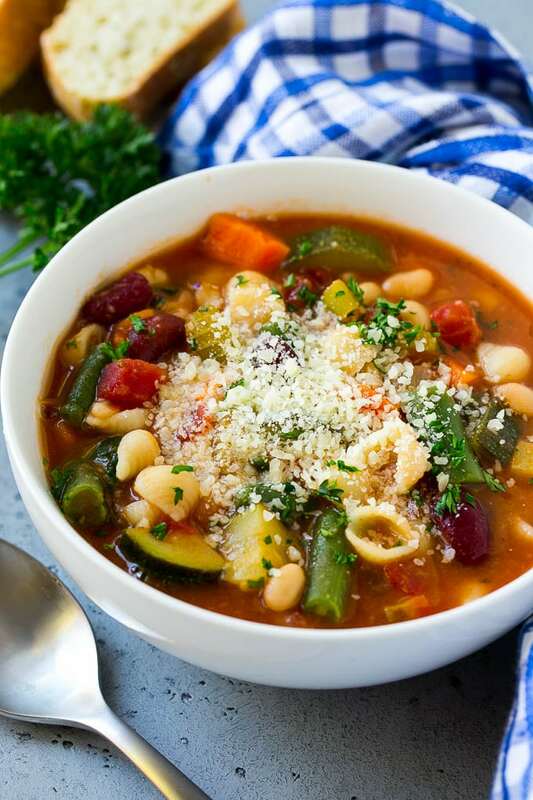 This Olive Garden minestrone soup is loaded with vegetables, beans and pasta in a tomato broth. It's a copycat of the restaurant version that tastes even better than the original recipe! Heat the olive oil in a large pot over medium high heat. Add the onion, celery, carrots and zucchini to the pot. Cook until the vegetables are tender, 3-5 minutes. Add the garlic and cook for 30 seconds. Season the vegetables with salt and pepper to taste. Add the tomatoes, vegetable broth, tomato paste and Italian seasoning to the pot. Bring to a simmer. Add the white beans, kidney beans, green beans and pasta to the pot. Simmer for 10-15 minutes or until pasta and vegetables are tender. Season the soup with salt and pepper to taste. Stir in the spinach leaves and cook for 2-3 minutes or until wilted. Sprinkle the parsley over the soup and serve. Looks overly delicious and very colorful! I feel like I could have some of it right now! I’ll have to try your recipe you’ve shared… thanks! Olive Garden Minestrone soup is one of my favorites! This looks incredible and super easy to make to. I’m going to try it out this week, yum!! First of all thank you for this amazing recipe, this looks really yummy and very healthy too. I love this kind of food, nice video by the way and this is easy to prepare. I have actually never eaten the Minestrone Soup from Olive Garden. I always get the salad but this soup looks amazing! I MAY just have to make it this weekend with the colder weather! Healthy too! This looks even better than Olive Garden thanks for the recipe. This looks fantastic! 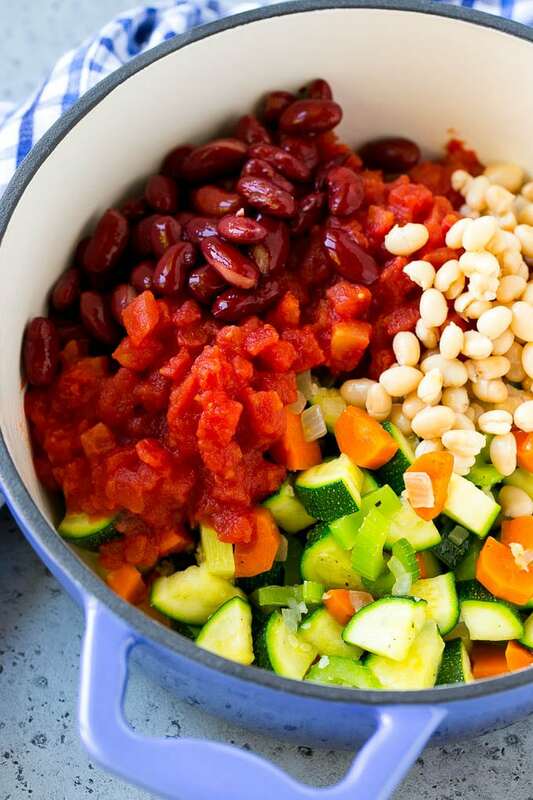 I’m not a fan of beans but this soup is so bright and has a lot of great ingredients. Perfect for this awful, cold weather we are dealing with! This looks delicious, especially on cold days like today!! I’ll definitely be giving this a try. This recipe is the best pick for me. I really enjoy going through your recipes, they always present something unique that makes them stand out! This looks absolutely incredible. I love a steaming hot bowl of hot soup in the cold weather. Minestrone is one of my favourites. 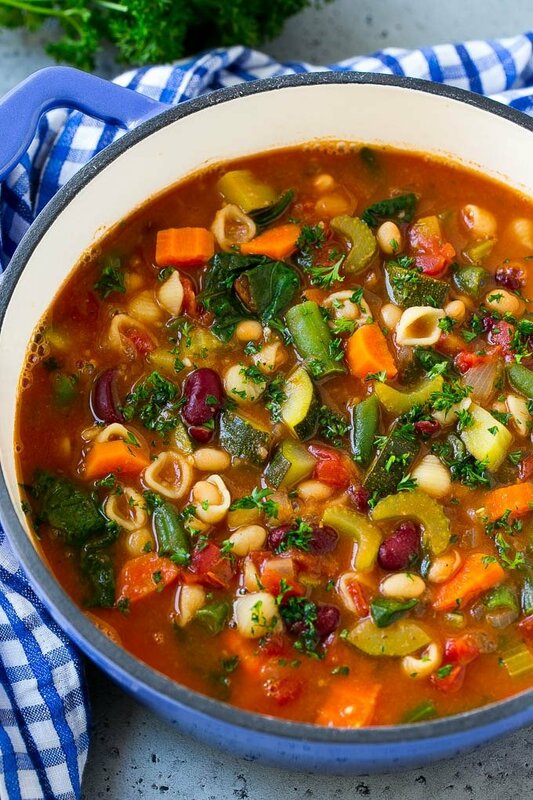 Your minestrone soup looks amazing. I love all the vegetables and all the colors in this soup. I need to try this soup. Thanks for sharing. This looks so tasty! And the parmesan on top is a nice touch. I bet this would taste great on a rainy day. 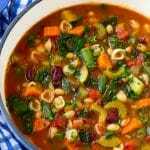 I have never cook minestrone soup before but these fresh veggies make it look so delicious!